In an ideal world, every member of your team understands their role and responsibilities and performs their duties flawlessly. Your role as a team leader is to help your team members develop and be successful. It is essential to the success of your team that you not only set standards and goals for team members, but also that you have the ability to hold them accountable for their performance. Although developing consensus surrounding performance standards and responsibilities from your team members is difficult, your ability to develop goals and standards collaboratively ensures commitment. As a result, team members agree to the process and are dedicated to its success. 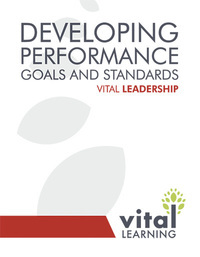 The Vital Learning Developing Performance Goals and Standards™ course helps managers and team leaders develop the tools they need to successfully implement effective performance goals and standards processes within their teams. By focusing on logical processes and reasonable commitments, Developing Performance Goals and Standards can help managers and team leaders outline clear work standards and encourage better job performance. By using the SMART—Specific, Measurable, Attainable, Results-oriented, and Time-framed—approach with team members, managers and team leaders demonstrate their commitment to an open and consistent performance improvement process. 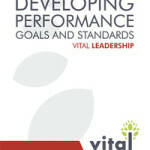 Click on the “e” to immediately enroll and begin the Developing Performance Goals and Standards online course.